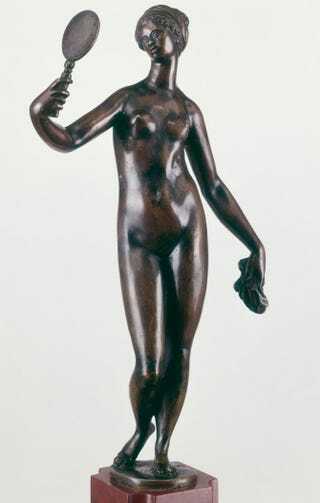 French or Netherlandish, Black Venus, second half of the 16th century. Bronze, 40.3 cm high. The black Venus brings to mind the dark-complected Andromeda, the daughter of the king of Ethiopia, saved from her fate as a sacrificial victim by the hero Perseus. The concept of the dark-skinned goddess can also be likened to contemporary court drama. A primary example is the Masque of Darkness, produced by Inigo Jones for King James I of England in the early 17th century. In contrast with the whitened skin fervently sought by Niger’s daughters, the black Venus fully accepts the appeal of her dark beauty. Her figure represents an attempt on the allegorical level to incorporate Africanness within the European experience. Once posited, however, the effortless grace of this conception of black beauty enjoyed only a brief reign. From the private delectation of monarchs and the intelligentsia, other, more compromised agendas were quickly imposed on the ideal form of the black Venus. Her grace and composure inspired a potent new image of the continent of Africa, represented as a metaphor, in elegant female guise, of the global agenda of European expansion. In the ultimate irony, her figure even came to stand for the transatlantic slave trade itself, the maritime origin of Venus twisted as a euphemistic gloss on the real horrors of the practice. Still, her original acceptance within the rarefied sphere of connoisseurship may not have occurred in vain. Seen as a presence worthy of emulation, the black Venus could also inspire those who staunchly opposed the depredations of slavery and the oppression of Africa’s children.